About 160 species, numerous in tropical regions, a few in the temperate zones. The large fleshy rootstocks of several tropical species furnish the yams of commerce. 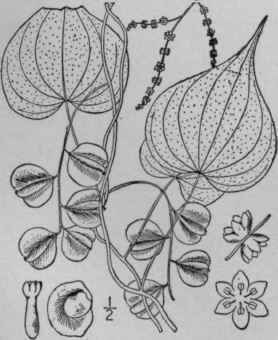 Type species: D. satlva L.
Dioscorea villosa L. Sp. PI. 1033. 1753. Rootstock slender or stout, simple or branched, horizontal, woody, 1/4'-3/4' thick. Stem 6°-15° long, twining or rarely suberect; leaves ovate, entire, slender-petioled, alternate or the lower opposite or in 4's, acuminate at the apex, cordate at the base, 2'-6' long, 1'-4' wide, 9-13-nerved, thin, green and glabrous or nearly so above, pale and pubescent or sometimes glabrous beneath; petioles often longer than the blades; flowers greenish yellow, nearly sessile, the staminate 1"-1 1/2" broad in drooping panicles 3'-6' long, the pistillate about 3" long in drooping spicate racemes; capsules membranous, yellowish green, 7"-12" long, strongly 3-winged, with 2 or sometimes only 1 thin-winged seed in each cavity. In moist thickets, Rhode Island to Ontario, Minnesota, Kansas, Florida and Texas. Rheumatism-root. June-July. Fruit ripe Sept., persistent on the vines into the winter. Consists of several races, by some regarded as distinct species, differing in the amount of pubescence and in the rootstock. The plant identified as D. paniculata Michx., corresponds closely with the Linnaean type.